Los Angeles Clippers forward Blake Griffin (left) fights with Golden State Warriors center Andrew Bogut (12) during the fourth quarter. UPDATE: On Thursday, the NBA agreed with the player for once, admitting in a statement that the Clippers’ star should NOT have been tossed from the game. "After a league review of the Clippers-Warriors game, we have come to the conclusion that Blake Griffin should not have been ejected from the game," NBA President, Basketball Operations Rod Thorn said in the statement. "A common foul should have been called on Griffin for initially attempting to dislodge the Warriors’ Andrew Bogut and a technical foul should have been assessed to Bogut for grabbing Griffin by the shirt and wrestling with him." There was no abundance of holiday cheer in Oakland on Wednesday. The bad blood between the Clippers and Warriors continued on Christmas Day, leading to two ejections and nearly causing a full-team brawl. Tensions boiled over in the final seconds of the third quarter, when Golden State rookie Draymond Green nailed Blake Griffin in the throat with an elbow to pick up the game’s first ejection. Griffin himself was tossed less than two minutes later, however, after battling with Andrew Bogut in the paint after the whistle. Bogut was assessed a flagrant foul, and Griffin was given his second technical of the game, prompting his automatic ejection. Jamal Crawford missed a 3-pointer at the buzzer to preserve a 105-103 win for the Warriors, but the chippiness did not end with the final horn. Chris Paul and Bogut began exchanging words after Crawford’s three fell short, and both benches — coaches included — gathered in an on-court scrum that took referees nearly 30 seconds to break up. These teams will now have more than a month to simmer down before their next meeting, another matchup at Oracle Arena on Jan. 30. 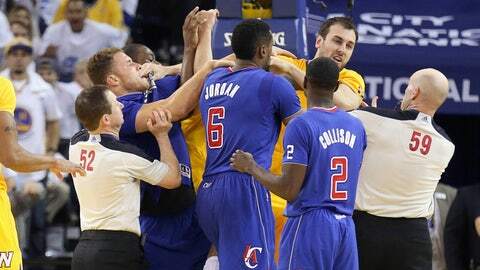 After the game, Griffin didn’t mince words when discussing the brouhaha.